Welcome to Classical Guitar Music in Printed Collections, an online index to repertoire in published collections and anthologies. As of 18 December 2018, the index includes the contents of 63 publications, listed here. Classical Guitar Music in Printed Collections is designed to be an online, continuously-updateable index to classical guitar repertoire in published collections and anthologies. It is intended for use in libraries and by aficionados of the instrument, and takes as its model and inspiration various print indexes of repertoire in collections, such as Songs in Collections by de Charms and Breed (Detroit: Information Service, 1966), or Historical Sets, Collected Editions, and Monuments of Music by Anna Heyer (3rd ed. ; Chicago: American Library Association, 1980). These invaluable printed works index the content of score collections and make them discoverable to the student, performer, or researcher. Even though some are decades out of date, they are so important that they are still in regular use in music libraries everywhere. In the classical guitar world, although there are numerous repertoire guides, there is no published index of printed collections. As a result, the contents of the many existing collections are invisible to discovery except by the most laborious means. Classical Guitar Music in Printed Collections was conceived to fill this void. The online format was chosen in order that the index be continuously updateable and, hopefully, never become obsolete. If it were published as a printed index, it would begin to go out of date the day it was printed. As an online index, it will be continually refreshed whenever new content is added, and each new version will be made available immediately. It is also, of course, free to use and accessible to anyone. What we have created is really an interlinked set of three separate indexes: an index of works, an index of composers, and an index of publications. The Work Index is organized first by work title, then by composer. Each entry lists the title of the collection in which the work is found, and the name of the editor thereof; if it is found in more than one collection there will be a corresponding number of entries. Each entry also displays an incipit image (an image of the opening bars of the score), showing the beginning of the piece exactly as it appears in that collection. The title of the collection listed under each entry is a clickable hyperlink that points to the entry for that title in the Publication Index. 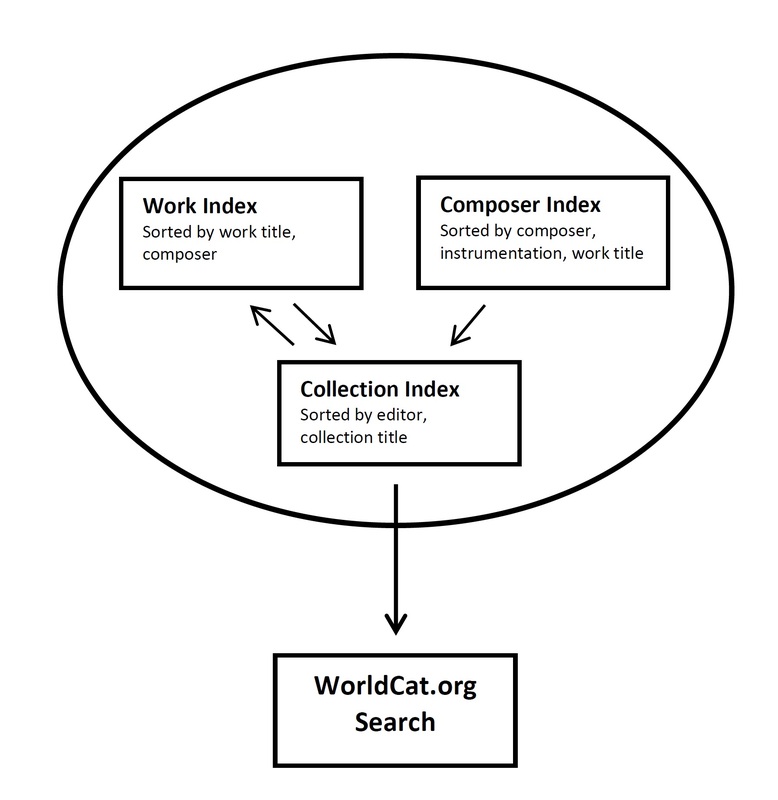 The Composer Index is similar to the Work Index in the information displayed, but the entries are arranged first by composer, then by instrumentation (1 guitar, 2 guitars, voice & guitar, etc. ), and then by work title. Each entry again lists composer, work title, collection title, and editor, with an incipit image from the published collection; the collection title likewise links to the corresponding entry in the Publication Index. The Publication Index is a list of the collections and anthologies indexed. The entries themselves are organized by the editor’s name, and then by the title of the publication. After each entry is a list of the pieces represented in that particular publication, organized first by instrumentation, then composer, then work title. The work titles are hyperlinks that point back to the appropriate incipit image in the Work Index. The entry for the collection title is a hyperlink that generates a search for that particular publication in OCLC’s WorldCat database, where it can be located in a public or academic library. Classical Guitar Music in Printed Collections allows a user to begin by browsing by work title, composer, or even instrumentation; to identify a piece and a collection containing that piece; and automatically launch a search that will locate the piece in a library from which it can be borrowed, or for purchase from an online vendor. The index is designed primarily for use by someone who has an idea of the piece they are looking for, but wants to know where to find a copy in a collection. If the title of the piece is known, or even suspected, the user may start with the Work Index, where all work titles will be arranged alphabetically. Each entry is linked, as described above, to the corresponding entry in the Publication Index. Each entry in the Publication Index includes a bibliographic citation and displays the complete contents of that collection, with each work title linked back to the corresponding incipit image in the Work Index. This is done so that the user may consider the collection as a whole, the better to evaluate whether to obtain a copy. Each entry in the Publication Index is in turn linked to a record in OCLC’s WorldCat database of global library holdings for that particular publication. Note that more than one entry will usually be returned in a WorldCat search, due to minor discrepancies in library cataloging between institutions. Classical Guitar Music in Printed Collections will link to the WorldCat record that we have judged to be the one most accurate and useful, usually the one with the greatest number of library holdings associated with it. The information returned by WorldCat will tell the user whether the item is available from a nearby public or academic library, or facilitate the placement of an Interlibrary Loan request if it is not. Individual entries in WorldCat are also linked to the websites of Amazon.com, Barnes & Noble, and Better World Books (if the item is available), allowing the user to purchase a copy for their personal collection. Please keep in mind that this a static (though frequently-updated) index and not a searchable database. It is our feeling that a browsable index is more useful than a searchable database for this purpose because it facilitates discovery of content previously unknown to the searcher. The native search functionality of the web browser (“control” + “F”) can powerfully enhance the browsing process by searching for key words or phrases. The publications indexed are printed collections and anthologies of classical guitar music. What is the difference between a collection and an anthology? One definition of anthology is “a published collection,” so by that definition all of the anthologies indexed here are also collections, and vice-versa. On the other hand, some say that an anthology includes works by different authors, while a collection includes works only by one author. We have defined the scope of this index as “printed collections and anthologies,” in order to encompass both types of publications. The initial emphasis of the index will be on incorporating content from larger anthologies of works by diverse composers, and this is expected to keep us busy for quite some time. If it ever becomes practical to turn our attention to smaller publications, we may choose to indicate a minimum number of pieces to qualify a publication for inclusion. So far, the issue has not arisen. The index is not a repertoire guide, since it only indexes pieces that are collected or anthologized in a larger publication. It has been designed specifically to help in finding pieces in collections, for which there has heretofore been no dedicated tool. If a piece has been published by itself as a single score, that publication will not be found here. Thus, although it may serve as a valuable adjunct to a repertoire guide, it would be a mistake to think of it as a repertoire guide in itself. We have attempted provide the kind of specificity that comes from title authority control by using incipit images from the indexed publications themselves. This way, a user looking for a particular piece can determine, for example, which of the many works by Sor titled “Moderato” in various collections is the one he or she is looking for. The same user may find the same piece in another collection under the title “Estudio” or “Study”; a thorough examination of the index might be necessary in order to find every published version. Titles in the index follow spelling and capitalization as found in the collections in which they appear. For instance, Noad’s The Renaissance Guitar contains “Drewrie’s Accordes” while Willard’s The Library of Guitar Classics contains “Drewerie’s Accordes.” (The Jane Pickering Lute Book indicates the title as both “Drewries accordes” and as “drewries accordes.”) No attempt has been made to correct titles or names of composers except in cases of the most gross and obvious error. That being said, titles have in many cases been modified with parenthetical additions in square brackets. In some cases this is because removing titles from the context of the original table of contents strips them of contextual identity: as, for example, when a piece is entitled “Saltarello del detto” (“Saltarello of the above”), or “Il suo salto” (“Its jump”). In such cases the referenced title or an abbreviation thereof is included in brackets, as: “Saltarello del detto [O perfida che sei]”, or “Il suo salto [Bal Todescho]”. In other cases, titles are modified parenthetically in brackets in order to better identify the piece indicated. Willard’s The Library of Guitar Classics, for instance, contains one entry in the table of contents for Bach’s Lute Suite in E minor, BWV 996, where it is listed as “Suite I” without reference to the individual movements. We have indexed the individual movements, on the conviction that this would make the index more useful, and have indicated the titles as “Passagio-Presto [Suite I],” “Allemande [Suite I],” etc. It should also be noted that some titles include parenthetical elements in the original publication, as for example “Tombeau de M. Mouton (Allemande)” in Noad’s “The Baroque Guitar.” These elements are rendered with standard parentheses rather than square brackets, to distinguish them from editorial modifications. On the other hand, where a title given in a publication is completely enclosed by parentheses, e.g., “(Senza titolo),” or where the first word or phrase is so enclosed, the parentheses have been removed so as to allow our database software to sort the title in the correct alphabetical order. Many users will notice inconsistencies in the quality of the incipit images in the Work Index and Composer Index. To some extent these are a result of varying quality in the copies of the original texts from which the incipits were extracted; however it is also the case that in the early stages of prototyping this index, we had not yet established a standard procedure for producing the incipits. As a result, some of the incipits from the first few collections indexed vary widely in quality. Since that time I have developed a strictly defined set of steps for producing images of consistent quality. As of March 2016, I have undertaken to replace all the poorly-produced early incipits with new ones that are clear and sharp. This will take some time, since there are thousands of incipits in the index. As a result, I will not be adding content to the index for a while. I will resume adding new content when I am satisfied with the quality of all the existing incipit images. Some of the collections indexed herein are published in multiple volumes: Bruno Henze’s Das Gitarrespiel, for instance. In these cases, a separate citation is provided in the Publication Index for each volume, so users can identify which volume contains a particular piece. A user who clicks on the citation for a particular volume, however, will in most cases find a WorldCat for the entire collection. This is because only a very few libraries create separate bibliographic entries for each volume of a multi-volume work. It is far more common for all of the volumes of the collection to be listed under an entry for the main title. We suggest, therefore, when searching for a particular volume of such a collection, that you revise your search in WorldCat by searching on the main title without the volume indication, and then examine which volumes are available from each institution holding the title. This small intervention on your part will return a larger set of matches. The only way to avoid this necessity would be to restructure the index without volume-specificity, which would in our opinion render it much less useful. This website is a work-in-progress, and always will be. If you are interested in knowing more about how Classical Guitar Music in Printed Collections is created, or would like to help with the task of organizing content for importation into the index, or would like to contact me for any reason at all, email me. I believe this index represents a model for indexing collections in a continuously updateable and easily accessible format that could be profitably deployed in other areas of the repertoire. I would be happy to share the back-end design with anyone who is interested.